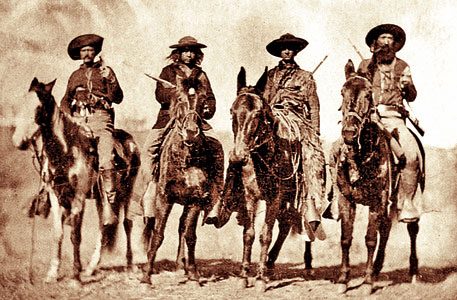 Bob Boze Bell's Big Bad Book of Bad Diary Entries: Custer Scouts Riding Mules or Horses? 2 horses and 2 mules! Two on left are horses....two on right are mules. From the left, horse, horse, mule, mule. Using ears and hybrid vigor for that ASSessment. I say, from my left to right, Horse, mule, mule, mule. Judging by their feet. I'm not an equine expert, but the two on the right definitely seem mule-ish. Ears are a giveaway, longer heads, and compare the hooves to the two on the left. I contend that mules' hooves are more compact and upright, not as broadly splayed as the average horse's hoof. Looks like the two on the right are mules. The two on the left look like horses. Ushally you can tell by how long the ears are. Could be the first case of fake news reporting. I agree...horse, horse, mule, mule.